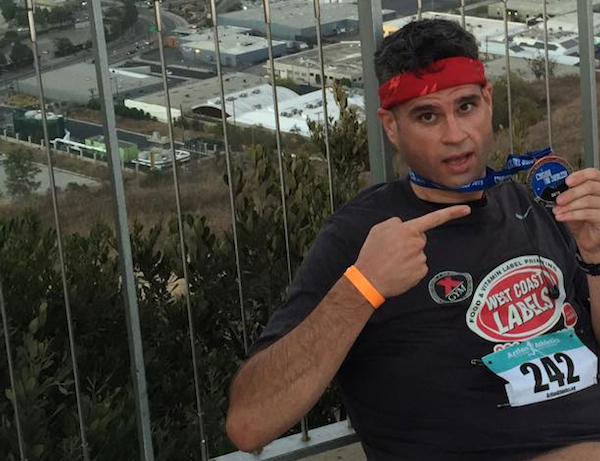 Race Recap: Conquer the Overlook 2015 | Keep It Up, David! I’ve been here a couple times before for a workout, and you can see lots of great pics in my post about going at dawn. 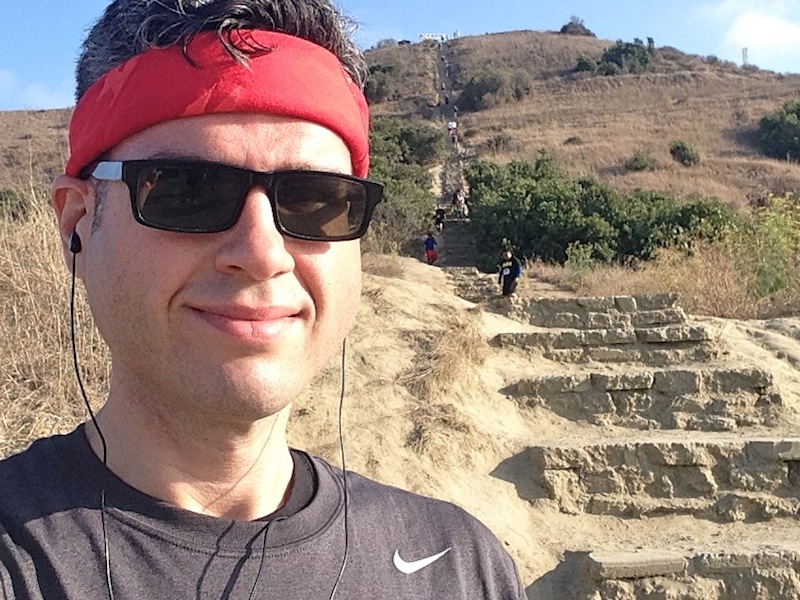 It’s a challenging stair climb, and here’s why: there’s no consistency. 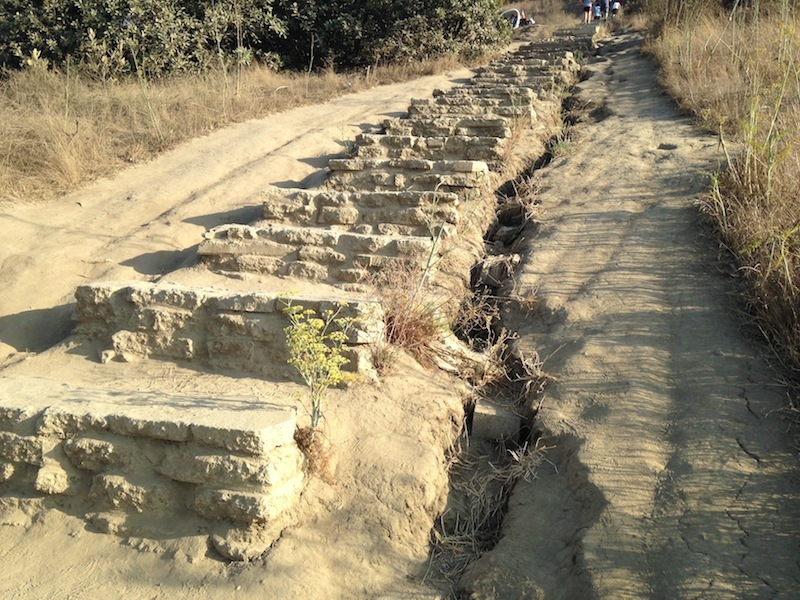 The steps are made out of recycled concrete, and they range in height from 6″ to nearly 2 feet. Some are shallow, some are deep, some are gentle, some are steep. 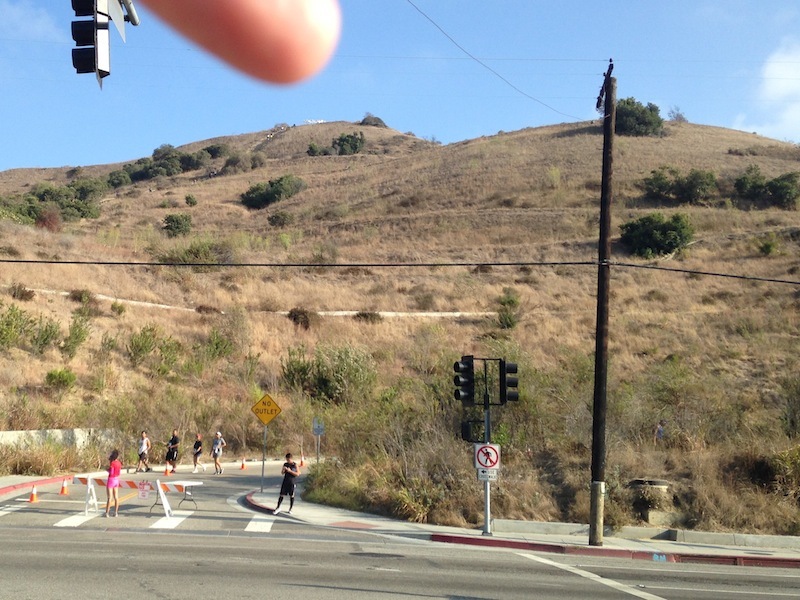 I’m pointing at the finish line at the top of the hill. Then, once you get to the top, you run all the way down again, and that’s when you switch into stair climbing mode, and ascend one final time, up the stairs. 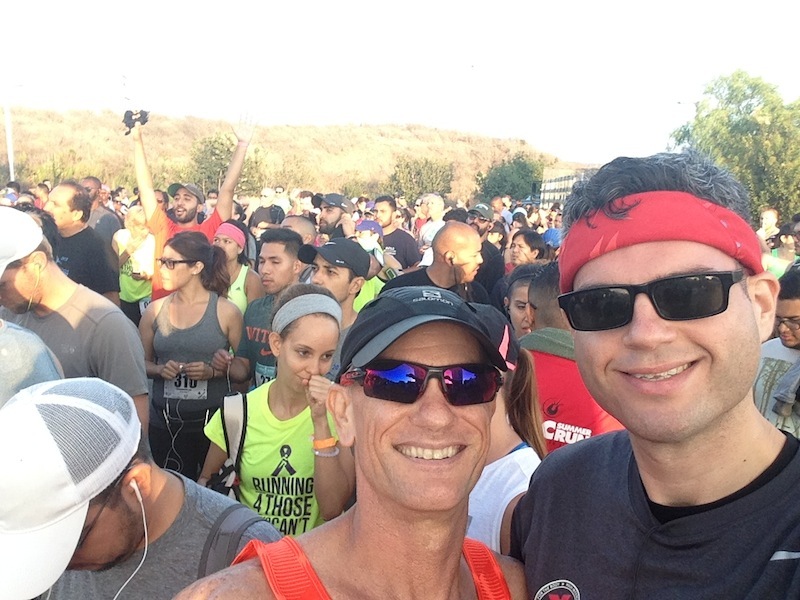 There were a couple hundred runners doing the race, and I snapped a selfie with my friend Jeff while we waited for the start. 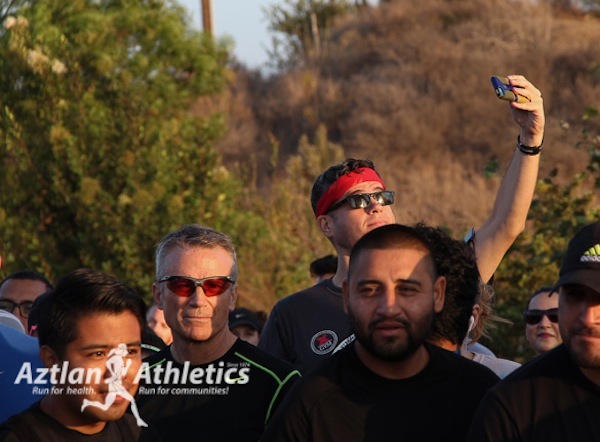 Turns out the official event photographer snapped a photo of me getting a selfie, which is funny. Jeff is a fierce competitor, and he wanted to start at the front of the pack. I knew he’d zoom out in front of me within seconds, but I don’t mind starting with the fast crowd. Sure enough, I was passed countless times at the beginning, but that was fine – I pushed myself to keep up. I trailed a woman all the way down the first descent, that I could never manage to pass her. That changed, though, when we started up the hill. 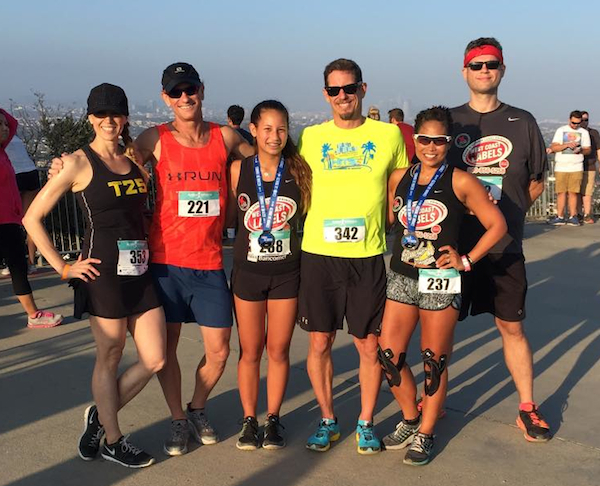 I may not be a frequent runner, but I have an extensive history of stair climbing, so while I was dreading the uphill part, I was ready for it. My goal on the uphill was to never stop running. No walking. Definitely no breaks. It was utterly exhausting, but I accomplished my goal. And that felt awesome. What felt even better was passing lots of people – including people that passed me earlier – because people were walking or stopping all over the place. The uphill part was broken into two halves, and after climbing halfway up, we detoured off the road and around the perimeter of two baseball diamonds, before continuing up. That portion around the baseball diamonds was the only flat ground during the entire race, and it came at EXACTLY the right time, because uphill running is tough! I started cramping up in places I’ve never felt a cramp before… but I pushed through it. Then I started noticing that I was neck and neck with another runner. While I focused on being consistent, he had a different approach: he would sprint a hundred yards or so, and then slow to a near-crawl to catch his breath for a while. We must have passed each other eight times, him passing me during his sprints, and me passing him while he recovered. During the second descent, I pulled out in front for a long while, and I thought I might not see him again, but low and behold, he flew by me near the base of the hill. 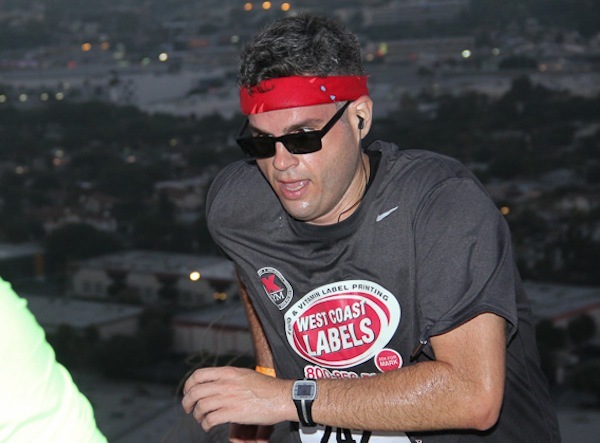 I really wanted to beat this guy, and I knew I’d have the advantage during the final leg of the race – the stairs. I’m good at stairs. It’s hard to look anywhere but at your feet on those stairs, because they’re so uneven, so I had no idea how far ahead he was when I started the climb. I finally saw him a third of the way up, stopped on a landing, and I charged ahead. This little rivalry (that existed solely in my own head) was the best motivation I could’ve had for this race, because it gave me something to focus on that wasn’t my aching, screaming muscles or pounding heart. …and my friend Madeleine had her camera ready when I collapsed against a railing immediately after, with my finisher’s medal. Did I mention this was an evening race? It started at 7pm, so it started getting dark during the race, which was a nice change of pace from racing at the crack of dawn. The organizers planned a nice after-party, with a band and free tacos and beer (I partook in the tacos but not the beer). I hung out with friends for a while before calling it a night. Having a community of racing friends has become one of my favorite parts of doing these events. This turned out to be a record-setting race for me: I set a new PR, for highest-recorded heart rate: 185! (Exceeding the 184 that I reached during the Aon Center race in April.) My time was 38 minutes, 42 seconds, which doesn’t mean much to me, as I have no point of comparison – but it will be the time to beat next year! This entry was posted on Monday, August 31st, 2015 at 12:56 am and is filed under Uncategorized. You can follow any responses to this entry through the RSS 2.0 feed. You can leave a response, or trackback from your own site. Fantastic David. I love that you had your own little competition with the other runner to keep you going. Those stairs look brutal in their inconsistency. Job well done! !